Orange is a delicious fruit containing lots of health and beauty benefits. Not only the fruit juice, its pulp even peel is also very beneficial to bring a radiant glow on your skin. Being a rich source of Vitamin C and many other anti-oxidants, orange is very helpful to fight against skin damaging free radicals. In addition, orange also contains a good amount of citric acid that gently exfoliates your skin and brightens your complexion. Orange juice as well as orange peel powder is used in various facial masks and packs. Let's have a look on some best orange fruit masks for fair, glowing and flawless skin. Mix all the ingredients and apply this mask on your face and neck. Massage for 2-3 minutes and then leave for 20-30 minutes. Now wash your face and neck with lukewarm water and finally pat dry with soft towel. You will feel an instant glow and smoothness in your skin. For best results apply this mask twice per week. 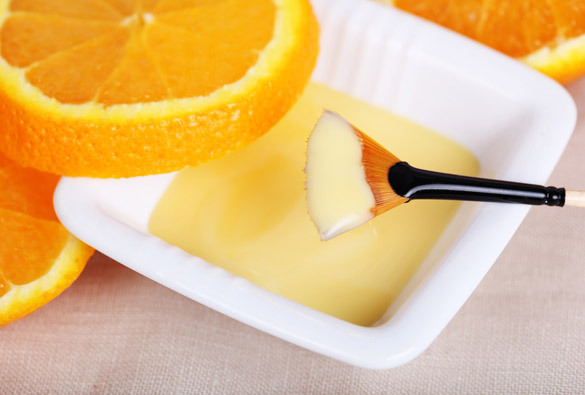 This orange fruit mask along some other ingredients will help a lot to get fair, glowing and white skin. To prepare this mask at home you need the following ingredients. Mix the orange peel, turmeric powder, lemon juice and yogurt apply this mask on face and neck. Massage with the paste and leave it on the face for 30 minutes or till it dries up. Now wash with lukewarm water and pat dry your skin. For better results apply this mask twice a week. Mix all the ingredients and apply this mask on your face and neck. Let it stay for 20-30 minutes or wait until it dries up. Now wash with fresh water and pat dry your skin. For better results apply this mask twice a week. Mix all the ingredients and apply on sun tanned dark sin for 20-30 minutes. When it dries up, remove this by gentle scrubbing and finally rinse off with fresh water. this is one of the best pack for sun tanned dark skin and by removing the sun tanned darkness it gives you an even skin tone with glowing complexion. Apply this 2-3 times per week. Mix all the ingredients and apply on the affected areas. Leave for 15-20 minutes and then rinse off with lukewarm water. This pack will really help in clearing acne scars give you smooth blemish-free skin. Mix all the above ingredients with enough quantity of water until a thick paste is formed. Using clean fingertips, massage a thick coat of the mixture to your face in a gentle circular motion. Let it sit for 15-20 minutes. Rinse your face with cold water, and pat dry with soft and clean towel. If your skin looks dry you can apply some olive oil for 10-15 minutes and then splash your face with fresh water. Again pat dry with soft towel This is one of the best natural mask for acne and pimple free skin. Mix all the ingredients to make a thick paste. Now steam your face to open up your pores. Apply the mixture onto your face using clean finger tips in a circular motion. Let it stay for 15-20 minutes. After this gently rinse your face thoroughly and pat dry with a clean and soft towel. (i) Always apply mask or pack on clean and dirt free skin. Use a mild soap to wash your skin and pat dry before applying any pack or mask. (ii) If you have sensitive skin then first make a patch test on any area of your skin. If it cause any allergic reaction then immediately remove this mask and wash your skin with fresh water. (iii) If you are allergic to any ingredient of any mask or pack, then don't use that mask or pack. (iv) Don't smile or talk with the face mask on. This will stretch your skin around the mouth and eyes and can cause wrinkles formation.